Fig. 1. Protones de Hidrógeno en distintas moléculas. 1. Onofre J, Martínez H, Arteaga M, Gómez A, Mauregui S. Espectroscopia por resonancia magnética en Enfermedades neurológicas. Rev Mex Neuroci 2002,3(4):213-217. 2. Onofre J, Martínez H, Arteaga M, Gómez A, Mauregui S. Espectroscopia por resonancia magnética en el cerebro humano. Principios básicos. Rev Mex Neuroci 2002,3(4):207-210. 3. Moriarty M, Belinda S, Li Y, Regal B, He J,Markowitz C, Grossman R, Gonen O. Espectroscopia por Resonancia Magnética de N-Acetilaspartato Cerebral Total Un Marcador Potencial para la Toma de Decisiones en la EM Recurrente-Remitente. 4. Matthews PM, Francis G, Antel J, Arnold DL. Proton magnetic resonance spectroscopy for metabolic characterization of plaques in multiple sclerosis. Neurology 1991;41:1251-1256. 5. Arístides A, et al. Temporal lobe epilepsy cualitative reading of HRM spectroscopy images for pre surgical evaluation. Radiology 2001;218:144-151. 6. Yuan Y, Min Chi Ch, et al. Reproducibility of hippocampal single voxel proton MR spectroscopy and Chemical shift imaging. Am J Radiol 2001;176:539-536. 7. Stark D, Bradley W. Neuroespectrocopia en Resonancia Magnética. Vol. III, Cáp. 72, Editorial Modby, pp. 1595-1635. USA, 2000. 8. Ernst T, Kreis R, Ross B. 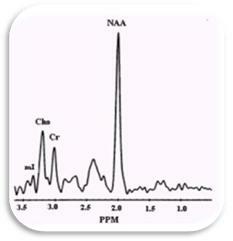 Absolute quantitation of water and metabolites in the human brain. I. Compartments and water. J Magn Reson 1993;102(1):1. 9. Myung K, Chang H, Systemic lupus erithematosus: brain MR imaging and single voxel hydrogen 1 MR spectroscopy. Radiology 2000:217:43-49. 10. Barker P. Magnetic resonance spectroscopy in cerebral ischemia and infarction. Seminars Cerebrovasc Dis Stroke 2001;1:331-342. 11. Martinot CP, Martinot CL. Rev. Per. Neurol. 2001:7(3). 12. Davie C, Hawkins C, Barker G. Serial proton magnetic resonance spectroscopy in acute multiple sclerosis lesions. Brain 1994;117:49-58. 13. Narayama PA, Wolinsky JS, Jackson EF, McCarthy M. Proton MR spectroscopy of gadolinium-enhanced multiple sclerosis plaques. JMRI 1992;2:263-270.